China is revisiting its periphery with a new, localized approach to regional multilateralism. China is revisiting the importance of its peripheries for engaging with its neighbors according to its ambitious economic plans. Beijing’s new approach is a top-down regulatory regionalism in exploring economic engagement with the neighborhood, particularly Southeast Asia and South Asia. Most notably, China is strategically positioning Yunnan province as its bridge to Southeast Asia and South Asia, managing the center-periphery bond by integrating Yunnan’s economy with the Association of Southeast Asian Nations (ASEAN) and South Asian Association for Regional Cooperation (SAARC) members. Yunnan, as a peripheral province, has not received the center’s economic attention in the past and historically had indifferent relations with central China. But the combination of geography, natural resources, and the political realities in the Asia-Pacific has turned China’s political attention to this southwestern province. Since 1999, via the so-called Western Development Strategy, China has committed to decreasing the widening gap between its eastern coasts and western land-locked region. Beijing planned to achieve the goals of speedy infrastructure construction, the development of industry, tourism, education, and technology, and the protection of environment in this western region through investments and free trade policies. Amid this larger strategy, Yunnan stands out. Geographically, the land-locked province shares international borders with Myanmar, Laos, and Vietnam. In addition to its links with Southeast Asia, it is also a potential alternative for engagement with South Asia, with Myanmar as a buffer state. The geographically more natural choice for this South Asia outreach — Tibet – is a sensitive political space, leaving the role to Yunnan. From China’s perspective, the time for bold interconnection with ASEAN and SAARC is now, necessitated by the dominant presence of the United States and European countries in Pacific waters to China’s east. Relying on Yunnan for cross–border diplomacy, China has established various arrangements and informal networks to keep both Southeast and South Asia engaged. Yunnan is currently a major part of the Asian Development Bank-funded Greater Mekong Subregion project connecting Cambodia, Laos, Myanmar, Thailand, and Vietnam with Yunnan. The province is also a key part of the Bangladesh-China-India-Myanmar (BCIM) initiative. Despite being apprehensive of the BCIM platform in the past, India has also shown its enthusiasm for a road linking Kolkata and Kunming, the capital of Yunnan. The BCIM project could also provide the northeastern states of India with access to the sea, if the plan to link Mizoram state with Myanmar’s Sittwe port through the Kaladana River comes to fruition. 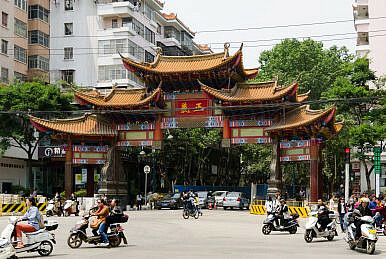 In 2002, Indian and Chinese scholars formed a Track-II mechanism called the Kunming to Kolkata Forum as a communicating platform to discuss potential economic cooperation at the state/provincial level. In 2013, Yunnan Governor Li Jiheng, met with the ASEAN secretariat and stressed the connectivity between the two. Li specifically emphasized the Singapore-Kunming rail link and the highway network from Bangkok to Kunming under the broader framework of the North-South Economic Corridor. Later in the same year, to capitalize on this growing network of ties, China’s central bank with other concerned departments launched a plan to establish a new financial pilot zone in Yunnan province and the Guangxi Zhuang Autonomous Region. Yunnan has also established many cooperative platforms with the bordering countries, such as the Joint Committee on Coordination of Commercial navigation on the Lancang-Mekong River, the Economic Cooperation Consultation of Yunnan and Four Provinces of Vietnam, the Yunnan-North Thailand Cooperation working group, the Yunnan-Myanmar Economic and Trade Cooperation Forum and various others. To exploit the similar potentialities in South Asia, the Yunnan government is participating in track 1.5 platforms such as the China-South Asia Business Forum and the China-South Asia Think Tank Forum, which emphasizes economic cooperation, trust building and mutual understanding. The yearly exhibition exchanges through the platforms of the China-South Asia Expo and the Kunming Import and Export Commodities Fair in Yunnan are also strategies to develop economic interest among the regions. China’s goal with respect to Yunnan is two-fold: acknowledging greater provincial autonomy and agency in multilateral arrangements on the external front and smoothing the friction toward the center on the domestic front. These multilateral arrangements allow the Chinese capital to be regionalized and while also localizing the regional capital. Thanks to these efforts, Yunnan’s provincial GDP became the third-fastest growing in China in 2013 due to growing infrastructure and investments. Despite China’s overall economic slowdown, last year, the province generated a total GDP of 1.4 trillion yuan ($209 billion) in 2015 and reported to be the highest of all time. Yunnan’s example suggests that China is actively taking the risk of experimenting with its peripheral provinces for the greater good of the center. Naina Singh is pursuing MPhil in international Organizations from Jawaharlal Nehru University, New Delhi. She has completed her Masters from South Asian University, New Delhi in International Relations with a special focus on South Asian region. Her research interests include primarily cultural and international relations, regional and sub-regional arrangements (Asia) and multilateral diplomacy. Will Tibet become China's bridge to South Asia under the Belt and Road Initiative?